Encouragement – 98 years worth. There are several universities that have developed a mystique, a character, about some of their basketball teams.. The 60’s – 80’s UCLA and Tennessee womens basketball, the current UConn womens basketball. Duke, UK, KU, UNC…they have a culture, legacy, tradition, and a history of winning. When one sees these names on their schedule- one nearly automatically pencils in a loss. The paragraph above sets the stage, the tone, the context of this note. I am not comparing, nor trying to place the Jays in that group. I can not deny who I am. I can not disavow my birth, birthplace, and my cultural/social environment. It is what it is, using the envogue expression. However, through education, continuous learning, broadening my interests, making new friends and associates, developing a positive outlook, among other things, I can keep the good and minimize the bad of my developmental history. I can decide for myself how I shall live. I can decide to do my best, or not. I can decide to be an asset or a debit. We always have a choice in the matter. I came to the Hilltop in 1975, on Uncle Sam’s GI Bill. I have followed Creighton Sports since then. Many have worn that uniform, some legendary- Silas, Gibson, Portman, Apke, Big Ben, Harstad, Gallagher, Buford, Korver, Funk, Woodfox, Jones, McDermott. Many more were not legendary, among them were- Bimbo Pietro, Charles Butler, Bob Scrutchens, Kevin McKenna, George Morrow, Vernon Moore, James Farr, Dusty Sitzmann, Brody Deren, Johnnie Mathies, Anthony Tolliver, Matty Dorwart, Jahenns Manigat. They all wore Creighton uniforms with pride and the desire to both represent the university well…and to win. The thing about Creighton is – they win. It doesn’t matter who coaches or who plays. All they do is win. That quote captures why the Jays were unable to get games with majors when we were at the Midmajor level, unless scheduled in an in-season or post-season tournament. It also explains the “love” from our Valley brethren and other Mids back in those days. It was one Midmajor version of penciling in a loss. Creighton has its’ own mystique, an air of mystery – as until joining the Big East, few had seen the Jays on TV. 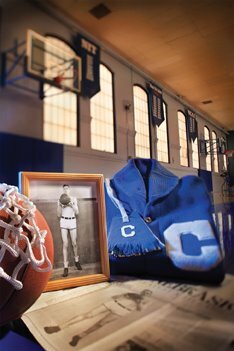 Many had heard of CU over the years, but relatively few had ever witnessed the magic. Put on that Creighton uniform with pride and respect. That uniform has legacy power, tradition energy, and magic. Creighton uniforms have transformed lesser players and unknown men/women into absolute terrors on the court/field/pítch. Those uni’s have won multiple hundreds of games and matches…winning is an automatic response when you wear it. Once you have worn it, you will never die – your name and exploits will live forever. It’s the suit! Your part is simple: Play smart, play hard. Give 110% effort. Play to Win! That’s it. Don’t worry or be scared – Just play. The uniform will do the rest. If a Creighton uní can make guys like Wragge/Torres legendary, imagine what it can do for you!